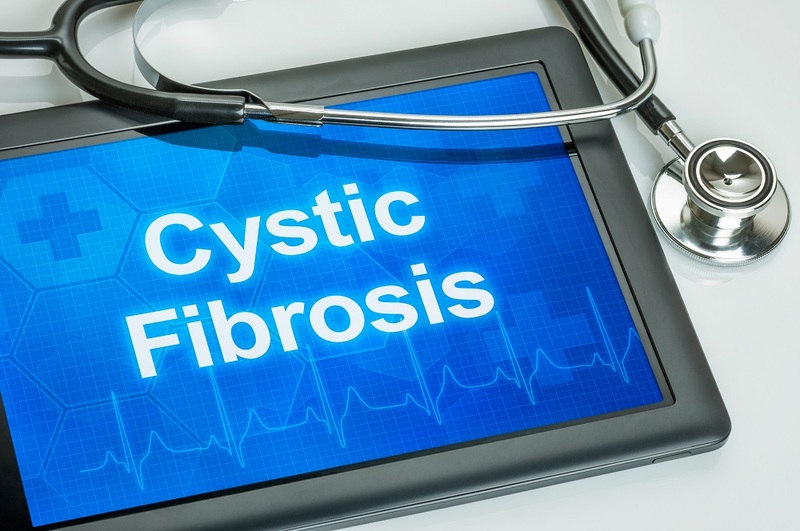 Cystic fibrosis (CF) is a hereditary disease that affects the cells in your body that make mucus. CF occurs when there is a mutation of the cystic fibrosis transmembrane conductance regulator (CFTR) gene. The mutation disables cells from moving chloride (a component of salt) to their surfaces. Without the movement of chloride, cells cannot hydrate properly. This leads to the production of mucus that is thicker and stickier than normal. CF can result in damage to the digestive system, lungs, and other organs that utilize mucus to function. The buildup of mucus can obstruct the ducts, tubes or passageways of these organs. All babies born in the United States are screened for cystic fibrosis by testing small blood samples. In other cases, if someone is suspected to have CF, their doctor can order a sweat test to determine if chloride levels are normal. Currently, there is no cure for CF. However; treatment is focused on alleviating symptoms and reducing complications. Treatment may include medications, physical therapy, pulmonary rehabilitation or surgery. To learn more about cystic fibrosis or to make an appointment with a pulmonologist at Jamaica Hospital Medical Center, please call 718 206 7126. This entry was posted in Pulmonary Medicine and tagged Cystic Fibrosis by Xavia Malcolm. Bookmark the permalink.